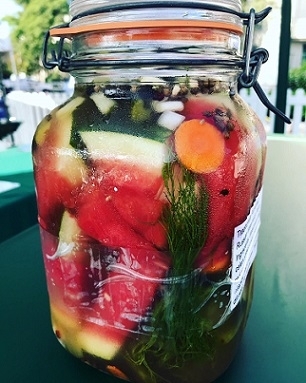 I entered two items in the Beverly Hills Farmers Market Pickle Fest Competition. "I Can Pickle That". 10 contestants. First Place for Russian Watermelon Pickles, a nice ribbon and a $100 gift certificate. "Best Dill Pickle in Beverly Hills". 11 contestants. Second Place for Kosher Dill Cucumber pickles, a nice ribbon and another $100 gift certificate. Traditional Russian/Ukrainian/Georgian Fermented Watermelon Pickles. 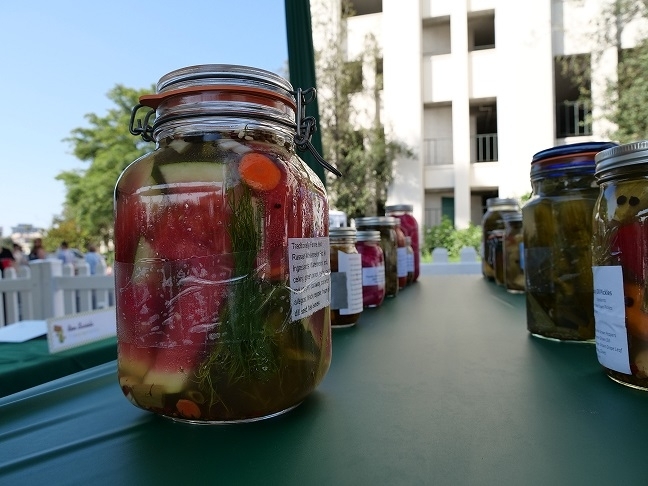 These pickles received high praise and compliments from the competition staff, judges, and the BH Farmers Market staff. These were lightly fermented for 1-1/2 days on the counter before being placed in the refrigerator to slow down the fermentation. Transported on ice and served ice cold during the judging. I left the rest of the batch to continue fermenting on the counter until I got back from the competition, 4 days total. When I got home the jar was bubbling like a mad science laboratory experiment, in the process of vigorous full fermentation. The resulting long ferment wedges have lost their refreshing, lightly sweet character and now more closely resemble traditional Kosher Dill Pickles. The sweetness of the watermelon has been entirely converted to lactic acid, replacing the delicious sweet and savory, briny flavors. Now heavier in kosher pickle taste with more aggressive flavors and the spices went from subtle background notes to up front, in your face and objectionable. A not-so-tasty reminder that spices "bloom" with time, I won't do that again. If you want to try the longer fermenting time, cut back on the allspice, dill and caraway seeds and the quantity of garlic. I heartily recommend you do the short ferment version, make plenty, and taste frequently to help you decide when to place in the refrigerator. Please make a large batch because you will likely sample your item away and have nothing left to serve to your friends. Darrell's Prize Winning Pickles--front left. This is the same recipe that Samantha and I demonstrated in our recent Slow Food Ways with Watermelon class. Lightly fermented watermelon wedges with an assortment of vegetables, spices and herbs, these are savory, not sweet. Made with the entire watermelon, they do not resemble the sugar-sweet watermelon rind pickles of the Deep South. HINT #1: The process does not require any specialized fermentation equipment. I fermented mine in an 8-liter Cambro plastic bucket on the kitchen counter, weighted down with a plate, and covered tightly with plastic wrap. HINT #2: Buy a good quality plain yogurt with live, active cultures. Voskos, Chobani, Fage, Brown Cow, etc... Not Yoplait, Dannon, or the store brand. The exception to the store brand rule is Trader Joe's. They source from top quality producers and their intent is to provide the best quality not the lowest price. Some of their yogurts are sourced from Brown Cow and Voskos. This was confirmed in a conversation with a yogurt sales representative I met in a Gelson's store. I suspect that Trader Joe's may get a couple more from Chobani and Greek God because of the identical ingredient lists. Still working on it. Leave it on the counter for a couple of hours before making this recipe so the whey separates. Mix a teaspoon or so of the clear whey in the brine just before adding it to the watermelon mix. This will insure that you have the necessary bacteria for a successful fermentation. The bacterial cultures used by yogurt companies are pure and are chosen to be consistent and, I suspect, especially for their vigor. HINT #3: Serve ice cold in the brine. Put your jar or serving bowl in an ice bath with a set of tongs. Do not drain them, or serve at room temp. The flavor and refreshing quality is enhanced when served cold, dripping wet, fresh from the brine. Traditional Fermented Whole Kosher Dill Cucumbers. This is the second time that these have scored Second Place. The 2 time second place finish is a great reason you should try making these. The first time I was disappointed, but now I feel that fermented dills are at a slight disadvantage versus vinegar quick pickles. In my opinion, fermented dill pickles are a somewhat difficult, finicky item that isn't on everyone's flavor palette. Difficult to time for a good cure and still retain a crisp texture, temperature is a major factor in the fermentation time. Warm weather requires close attention to the process. Most people are now on the Claussen, Vlasic, industrial food, vinegar quick pickle bandwagon. Commercial producers use crisping agents to keep that extra crunch. Fermented cucumber pickles will always be somewhat softer than vinegar quick pickles. I make these because I like them. You should give them a try. Again, no special equipment is needed. I used a bale-type preservation jar with the lid left loose so the CO2 doesn't build pressure and break the jar. Cheap and easy to make, and quite expensive to buy. Comparable Bubbies Kosher Dills are running close to $8.50 for a 28 oz. jar. Persian cucumbers are typically $1.00/lb. From $.50 to $1.50 on average. Cucumbers, salt, water, fresh garlic, fresh dill and dill seed. Naturally present lactic acid producing bacteria provide the necessary acid to preserve the pickles. Hint #1: You can “cheat” by using the yogurt whey starter as outlined above. Mine fully fermented in 2½ days. Give these a try. A good place to start. If you want to enter a food competition, pick food items with wide appeal. Avoid items with strong "Love It or Hate It" flavor profiles. Two judges obviously did not care for the kimchi, not so subtly spitting their tasting samples into their napkins. Ditto for two different samples of pickled onions. I don't know if the contestants saw this, but it might have been painful to watch. Just because you love it, that doesn't make it worthy of the time and effort to enter it in a competition. Consider your choices carefully and be sure to test them out on a larger audience. It would be unreasonable to expect a judge to score your item favorably if they don't like it.